Preheat the oven to 180C / Gas Mark 4. Use a sharp knife to slice the top off each pepper horizontally. Don’t discard these tops as they will be the little hats for the pepper lanterns. Deseed, rinse and pat dry with a kitchen towel. 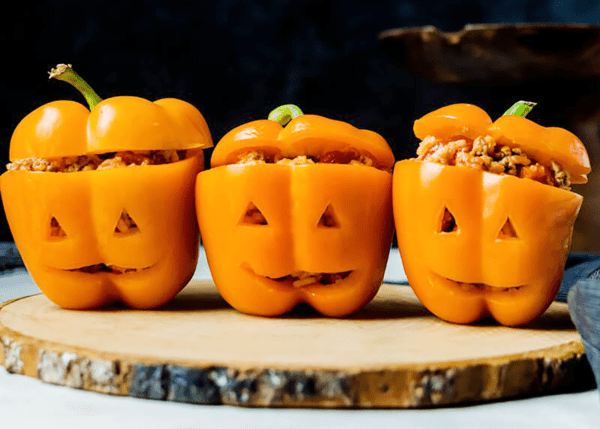 Use a small paring knife to cut holes into the exterior of the peppers to make pumpkin-lantern style faces. If the peppers don't stand upright, slice a small amount from the bottom to flatten the surface. Cook rice according to package directions. Lightly oil a baking tray and cook the peppers for 20 minutes, or until cooked, but still are still firm. They mustn’t collapse! Remove from the oven and allow to cool . Heat 1 tbsp oil in a large frying pan over medium heat. Add the chopped onion and mushrooms and sauté for 3-4 minutes, until the mushrooms have softened and reduced in size. Increase the heat to medium-high. Add mince, herbs and chilli flakes and continue to cook, stirring occasionally until browned. Drain the excess oil. Reduce heat to low, then add the pepper sauce and cooked rice. Cook for 2-3 more minutes, or until mixture is heated through. Fill each pepper to the brim, allow the mixture to spill over slightly. Place a top on to each stuffed pepper and serve with green salad.